Ash trees in Oak Ridge are dead or dying due to a pest known as the Emerald Ash Borer. Once compromised by the beetle, the trees pose a significant hazard to people, property and the power lines in our community. Over the next few weeks, in order to prevent incidents due to fallen trees and branches, the Oak Ridge Electric Department will be identifying and, in some cases, removing ash trees found in the public rights of way adjacent to power lines. Many ash trees in Oak Ridge are already dead or damaged beyond the point where they can be saved. The trees are being killed by an imported pest called the Emerald Ash Borer, or EAB. The beetle was accidentally introduced to the U.S. about 15 years ago. Since then, they have destroyed millions of trees on a scale not seen since the chestnut blight. In one study, the time period between discovery of the first infected ash trees and nearly 100 percent death of those trees was just six years. Infected trees were first found in Anderson County in 2012. The Oak Ridge Electric Department is beginning a concerted effort to identify and deal with ash trees on public rights of way that could impact overhead power lines. 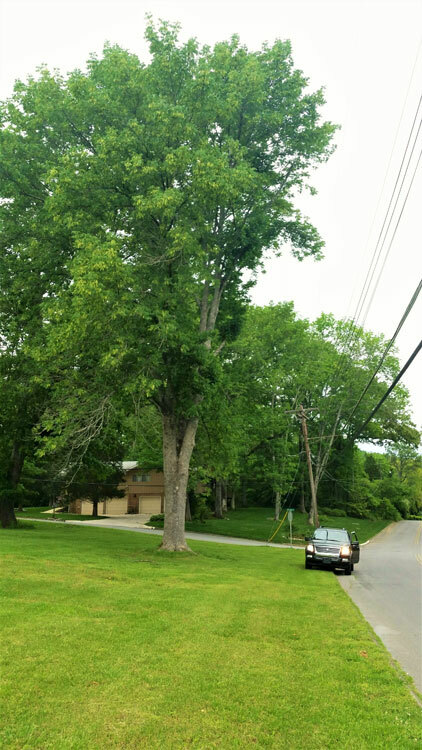 If large ash trees affected by EAB are found on private property, Electric Department crews will contact the owners to discuss safety concerns and possible options. In the meantime, the Electric Department strongly encourages property owners to search their properties for ash trees. If you find an ash tree in your yard, the Electric Department recommends consulting a tree professional to find out if your tree can be saved or if it has to be removed. After speaking with several experts in the field of forestry, Suggs said they all agreed on one thing: “Left untreated, every ash tree in Oak Ridge will die and die quickly.” Suggs also strongly advises customers to request qualifications and insurance certificates of any professionals they hire. To learn more about the EAB, visit www.emeraldashborer.info. The website is maintained by several universities and contains important up-to-date information regarding the EAB pest.